On February 9th, first-year Inside Wireman apprentice Carey James of the NECA/IBEW Local 26 Joint Apprenticeship Training Committee was the featured speaker in a Center for American Progress event called Investing in Our Nation’s Human Capital Through Apprenticeship. 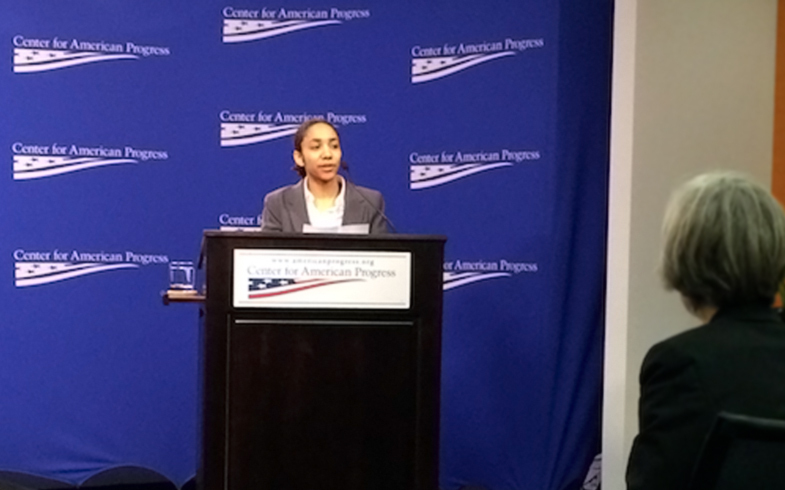 The event, held at the Center for American Progress in Washington, focused on how building our nation’s human capital is an important strategy to expand economic opportunity and improve mobility for workers. Apprenticeship, an effective worker training strategy that combines on-the-job training with classroom instruction, stands out as a promising way to invest in and grow our human capital and, in turn, boost productivity and wages and accelerate economic growth and competitiveness over the long term. Former Kentucky Gov. Steve Beshear (D-KY) provided a keynote address on the importance of creating more opportunities for workers and employers to participate in apprenticeship. According to the Center for American Progress, despite the benefits that apprenticeship provides for workers and employers, it is frequently overlooked in the United States: In 2015, less than one-half of 1 percent of the nation’s workforce was engaged in an apprenticeship program. At the February 9th event, a panel of leading experts discussed the barriers to expanding apprenticeship in the United States and what policy solutions can be implemented to expand opportunities for workers to get in-demand skills through apprenticeship.